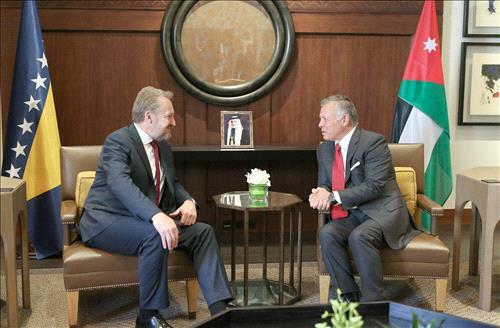 AMMONNEWS - King Majesty King Abdullah II held talks at Al Husseiniya Palace on Wednesday, with the Chairman of the Presidency of Bosnia and Herzegovina Bakir Izetbegovic that focused on means of forging closer ties between the two countries as well as the latest developments in the region. During expanded talks that were preceded by a bilateral meeting that was attended by His Royal Highness Prince Hashem Bin Al Hussein, the chief chamberlain, the two sides stressed the importance of boosting bilateral cooperation in the economic, investment, tourism and military fields. King Abdullah affirmed the importance of strengthening friendly relations between Jordan and Bosnia and Herzegovina and building on these relations to serve the interests of both countries. His Majesty highlighted Jordan's efforts in countering terrorism, pointing to the "Aqaba meetings" that aim to boost security and military coordination and cooperation and the exchange of expertise and data among all regional and international parties to fight terrorism within a holistic approach. He also pointed to available opportunities to enhance bilateral cooperation in a number of areas, adding that he was looking forward to fruitful talks with the Bosnian side. The Chairman of the Presidency of Bosnia and Herzegovina voiced his keenness to bolster cooperation with Jordan as well as his appreciation of Jordan's role and its historical stances on achieving security and stability in the region and the world. He also hailed Jordan's role in hosting refugees and providing them with all possible assistance as well as the Kingdom's efforts in preserving security and peace in his country. King Abdullah also discussed with Izetbegovic the Palestinian issue, affirming that the region will not enjoy peace and stability until a just and permanent solution is found for the Palestinian-Israeli conflict based on the two-state solution that leads to the establishment of an independent Palestinian state within the June 4, 1967 lines with East Jerusalem as its capital. On the fight against terrorism, the King and Izetbegovic emphasized the need to intensify international efforts to counter terrorism as it threatens global peace and security. The meeting was attended by the prime minister, the King's advisor, the director of the King's office, the King's advisor for economic affairs, the minister of foreign affairs and expatriates and the delegation accompanying the Chairman of the Presidency of Bosnia and Herzegovina.